Moscow, the capital of the Russian Federation, is a political, economic, cultural and scientific centre. It was founded in 1147 by Prince Yuri Dolgoruki on the outskirts of Suzdar Principality. At the end of the 15th century Moscow became the capital of the first Russian centralized state. At the beginning of the 18th century. 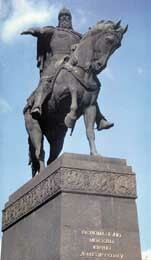 Peter the Great moved the capital to St. Petersburg. After the October Revolution it became for the second time the capital of a new state. The Moscow Kremlin: a symbol of Moscow and Russia. It�s the former residence of Russian tzars and patriarchs. It holds a unique collection of historical, architectural and cultural items. The Kremlin contains such unique masterpieces of ancient Russian architecture as the Cathedral of the Assumption � once the main cathedral of Rus, where tzars were crowned and patriachs buried; the Cathedral of Archangel Michael, the burial place of Russian tzars and Grand princes; the Cathedral of the Annunciation, the royal chapel. The Armoury Chamber, established in 1720 by order of Peter I, is the oldest Russian museum and a treasure house of Russian artistic craftsmanship from ancient times till our days. Red Square has had different names over the long years of its existence. Red Square is a unique architectural ensemble. Here is the gem of Russian architecture � the Cathedral of the Intercession (St. Basil�s Cathedral), the State Department Store (GUM), the Lobnoye mesto, the State History Museum. 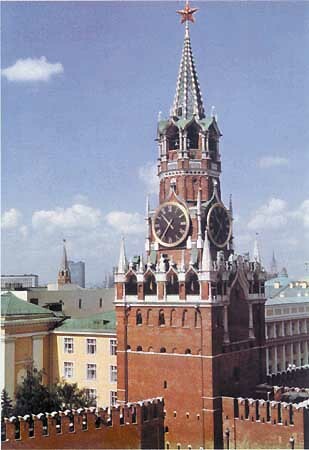 Red Square is famous for the many historic events is has witnessed. The Intercession Cathedral (St. Basil�s) is a unique monument of Russian architecture. It is a living witness of the Russian history. The Cathedral of St. Basil�s was built in honour of the final victory of Russian people over the tatar-mongols and the capture of Kazan (16th cent.). Now it is a branch of the State History Museum. The Tretyakov State Gallery, one of the world�s largest museums, a treasure house of old Russian art from the 11th cent. till our days. The gallery bears the name of its founder, Pavel Tretyakov, a rich Russian manufacturer and patron of art. He presented his collection to the city of Moscow in 1892. Now the Tretyakov Gallery holds more than 50000 works of painting, graphic art and sculpture. The Pushkin Museum of Fine Arts, one of the most famous museums of Western European. It is the second museum after the Hermitage as far as its collection is concerned. It was founded in 1912, as a collection of copies of famous sculptures of antiquity. Now it is one of the largest museums in the world with the unique collection of original works from Ancient Egypt, Fayum portraits, Western European art, a collection of impressionist and postimpressionist painting. Kuskovo. The palace and park of Kuskovo are one of the outstanding monuments of Russian culture. The palace, ponds, canals, pergolas and the park form the ensemble of the 18th cent. The palace of count Sheremetyev was built in the second half of the 18th cent, in the early classical style. The palace and park pavilions contain an exhibition of the State Ceramics Museum. Kolomenskoye. The architectural ensemble of Kolomenskoye, the former summer residence of Russian tzars was built in the 16�17th cent. It is an original example of ancient Russian architecture. The Ensemble includes the famous Church of the Ascension of the 16th cent. built in the old Russian �tent� style. An open-air museum includes examples of Russian wooden architecture of the 17�18th cent. The museum holds the collection of icons, metalwork, tiles, ets. The Moscow metro is considered the best in world. Today they cannot imagine Moscow without the metro. The metro map matches exactly the town map. It repeats Moscow�s traditional radial-circular lay-out. 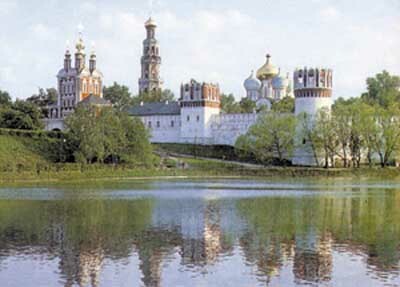 The Novodevichy (New maiden) Convent was founded in 1524 to commemorate the recapture of the old Russian city of Smolensk. The convent was built as a fortriess on the approaches to Moscow. The convent is unique ensemble. One can see the domes of its Cathedral of the Holy Virgin of Smolensk from quite some distance. The collection of the museum includes icons of the 16�17th cent., an exhibition of embroidery and jewellery. It is the residence of the Metropolitan of Moscow at the same time. On the grounds of the Convent there is the necropolis, where famous people are buried. 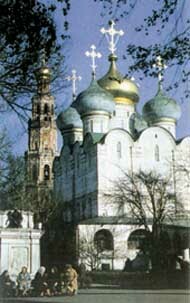 The Holy Danilov Monastery is the oldest in Moscow. It was founded in 1282 by Grand prince Daniil, the youngest son of Alexander Nevskii. The monastery suffered a lot during the course of history, many times repulsing enemy attacks. From ancient times the monastery has been one of the centres of the Orthodox religion, culture and enlightenment. In 1987 the monastery was restored and expanded. The monastery is the venue for international ecumenical and peace conferences and religious assemblies organised by the External Church Relations Department. Nowadays it is the centre of the Moscow Patriarchate, the Moscow residence of the Patriarch of All Russia, an active monastery. Sergiev Posad (the former Zagorsk). The history of the town is closely linked with the name of St. Sergius of Radonezh, who becoming a monk, in 1337 had founded the Monastery of the Holy Trinity. In the 17th cent. the monastery was turned into a strong citadel which repulsed enemy attacks on more than one occasion. Nowadays it is an active monastery with the theological Academy. It is a religious centre of the Russian Orthodox church, one of the residences of the Patriarch of All Russia. Its architectural ensemble of the 15�19th cent. represents all stages in the development of Russian architecture. The museum boasts a rich collection of icons, rare examples of folk art and Russian national dresses. Savvino-Storodgevsky Monastery. Situated in the town of Zvenigorod, 60 km from Moscow, it is one of the gems of Russian architecture of 15�17th centuries, the former summer residence of Tzar Alexei Romanov. Trinity-Sergius Lavra (70 km). It is the religious centre of Russian Orthodox church, the residence of the Patriarch of All Russia, a working monastery, with the Theological Academy. 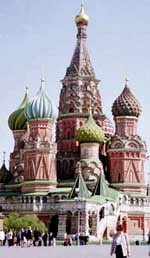 Its architectural ensemble of the 15�19th centuries represents all stages in the development of Russian architecture. The museum boasts a rich collection of icons the 15�17th centuries, rare examples of folk art and Russian national costumes. Klin (90 km) is one of the oldest cities of Central Russia. For the first time it was mentioned in the chronicles in 1234. Due to its advantageous position the town grew rapidly. Klin is famous for P. Tchaikovsky�s house-museum. The great Russian composer lived here for the last 8 years of his life. In Klin he wrote The Nutcracker and Sleeping Beauty, completed the opera The Queen of Spades. The memorial museum attracts not only musicians from all over the world but also lovers of the great Russian composer.